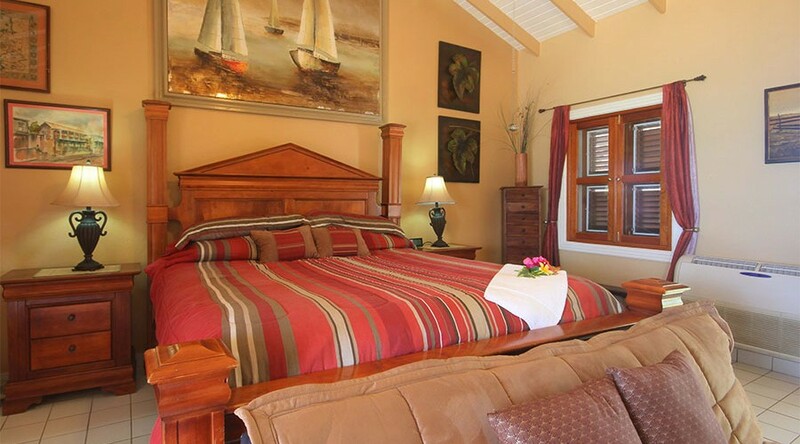 Mary’s Boon Beach Resort prides itself in offering several types of accommodations to suit different needs and budgets. Two broad categories of accommodation exist i.e. Studios and Suites. All accommodations are decorated in vibrant Caribbean colours, complementing the suns brilliance, the aqua tones of the ocean and the verdant foliage in our gardens. 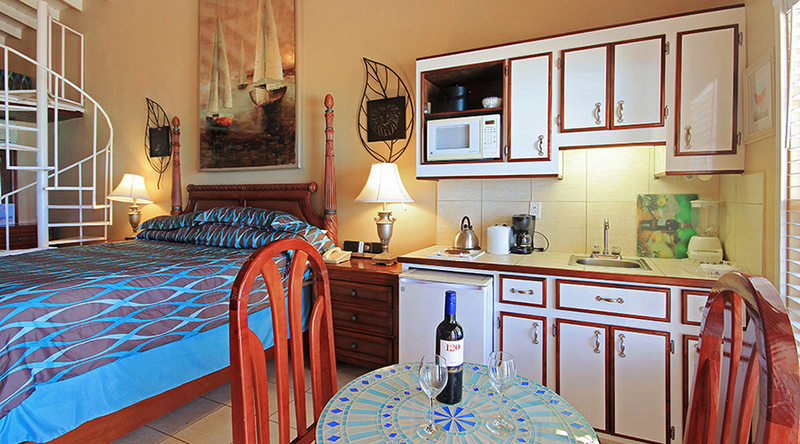 Rooms have air-conditioning and Cable or Satellite TV, full kitchens or kitchenettes. In the Studio category you can choose from a Deluxe, Beachfront, Garden, Lower Garden, Lower Lobby or Mini Garden unit. Each type of Studio accommodates one or two persons in a comfortable room with a king size bed. All except the Mini Garden Studios have comprehensive kitchenette facilities which include a fridges, microwave, coffee pot, two burner stove top and all the necessary crockery, cutlery and cook ware accessories. Of the Suites we are able to offer, we have Deluxe Beachfront One and Two bedroom options, as well as a Garden One Bedroom, a Garden Two Bedroom and a Lower Garden Two Bedroom so that families are catered to also. The Suites differ from the Studios by offering more spacious accommodations and in certain categories, living rooms and full kitchens. If you have a preference for a particular room which you may have enjoyed previously, we attempt to hold that room for you but we cannot promise to do so. There may be last minute changes to your room number allocation, however, your category of choice will always be guaranteed. All accommodations are air conditioned and have Cable TV. The rooms are decorated in vibrant Caribbean colours to compliment the brilliance of the sun, sea and verdant foliage in our gardens. They are all located paces away from the sea. There is no other hotel in St Maarten where you can step out of your Deluxe Beach accommodations right onto the beach. For further information regarding the rooms, please go to Room Descriptions on the rate page. We look forward to answering any other questions you may have and seeing you at The Boon. Come …….. Experience the Magic! For maximum two-person occupancy, studios are efficiency units with king size beds and fully equipped kitchenettes. Difference locations can be chosen. Studios are available on the Beachfront, in the Garden, Lower Garden and Lower Lobby. In the most desired position on the property, these units are at ground level opening onto the beach. They have king-size beds and covered patios for al fresco dining. A popular choice, these Studios are located overlooking the beach and all have uninterrupted sea views. Some are positioned at ground level and others on the first floor, and they have king or queen size beds. They open onto adjoining gingerbread-adorned verandahs. Located in the Garden on ground level, Garden Studios provide comfortable accommodations, with king size beds, at a moderate price. This category comprises two roomy basement studios accessed from the garden, and offering comfortable budget accommodation with a king size bed. There is no view. Great for in-transit visitors, this budget accommodation offers a spacious room with a king size bed. Situated in the main building, they open onto the basement lobby and have no view. Perfect for the budget conscious traveler, these Studios are located at the back of the property or in the garden. This room type offers great value for a quick stopover, with easy access to the airport. They have double beds and a basic kitchenette facility. Suites accommodate more than two occupants. They are more spacious than Studios. Some offer full kitchens and living rooms. These units have a separate bedroom with a king size bed, a living room, a full kitchen and a bar counter or dinette. The units open onto the beach at ground level. Rates are quoted for double occupancy and additional guests are accommodated at a nightly supplement of $35 per person. A “one-of-a kind room”, this unit accommodates four persons in an open-plan lofted Suite which opens onto the beach. On the ground floor there is a king size bed and kitchenette. In the loft, accessed via a spiral wrought iron staircase, there are two single beds overlooking the studio below. There is also a covered patio for shade. Leading onto the garden and for spacious family accommodation, the Garden Two Bedroom unit has a replica tag heuer master bedroom with a king size bed, a queen size bed in the second bedroom, a living room with two sofa beds, a dinette and a full kitchen. This unit provides affordable and spacious accommodation for a family of four. It has a king size bed in the main bedroom, a double bed in the second bedroom, a shared bathroom and kitchenette. The Lower Garden Suite leads down from the garden and so it has no view.